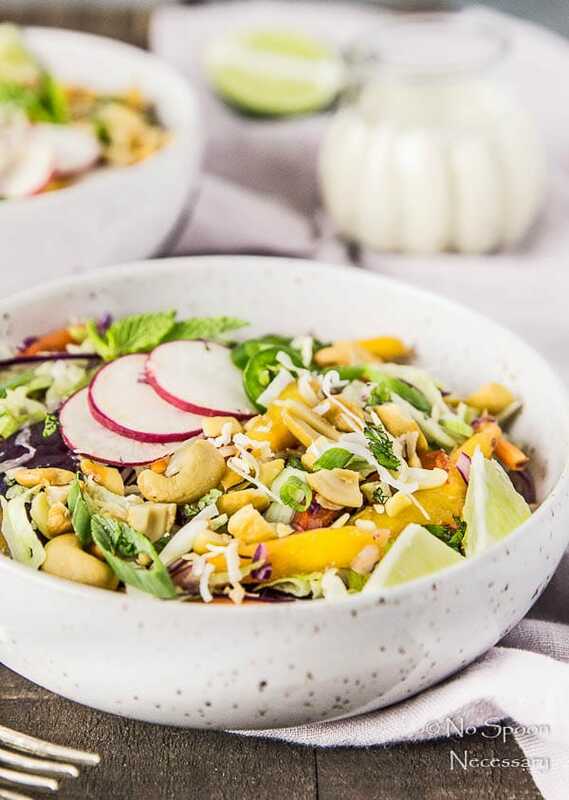 A mix of crisp, cool shredded cabbage and veggies, generously topped with tropical, sweet mangoes and salty, crunchy cashews, garnished with fresh mint and drizzled with a slightly spicy, tangy, impossibly creamy and smooth coconut-lime vinaigrette. 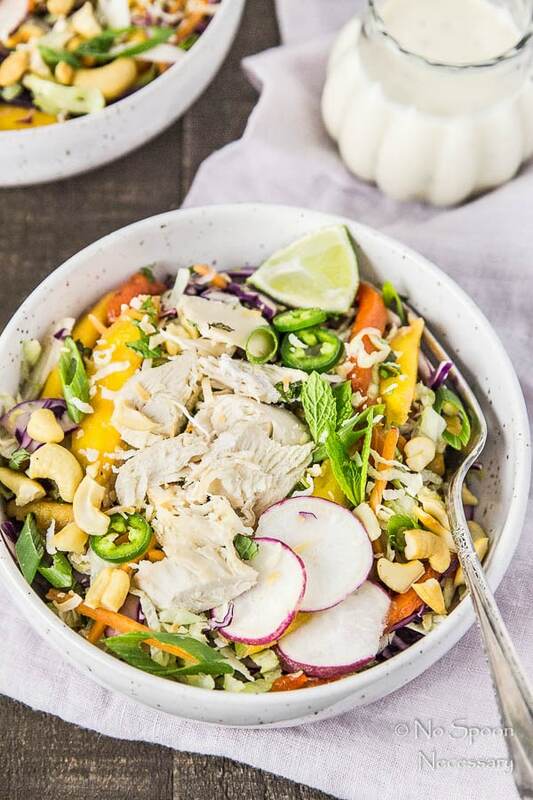 This Thai Cashew and Mango Slaw Salad is ridiculously easy and seriously tasty! Hiiiiiii friends! Happy second to last UNOFFICIAL Monday of summer. I am shouting ‘UNOFFICIAL’, because I like to yell and shout. Oh. Wait. No. Errrr, because I want to be clear – today is only the second to last Monday of UNOFFICIAL summer. We still have a few weeks of official summer left. 3 to be exact. But, I know there are lots of people who just can’t wait to jump on board the pumpkins-on-all-the-things train. And while I’m not hating on those overjoyed for fall, I am simply not one of them. I will be over here at the SuBourbon Country Cottage clinging onto every last second of summer like my life depends on it. Father time will have to rip summer from the clutches of my cold dead body. Okay not really. I’m being dramatic. But seriously, heirloom tomatoes, corn on the cob and vibrant vegetables, I heart you forever. Before Tyler, I didn’t believe in all that hoopla – mediums, clairvoyants, Ouija boards, séances, necromancy… none of it. And I still don’t really. BUT, I DO believe in Tyler. I unquestionably think he has the capability to communicate with the dead. I mean, have you seen the show?! Unless all the celebrities are in on it and feeding him highly sensitive, top secret information, he HAS to be a REAL medium. Just sayin’. Whenever I watch the show I get a little teary eyed. Yes, because I’m a sap. But also, because I think of the people I have lost, mostly my dad, and I wonder if they are with me on a daily basis. …And then I wonder if they practice personal space. Because, there are just some things we are supposed to do ALONE in this world. You pickin’ up what I’m puttin’ down? Anyways, it makes me wish I could afford Tyler. I would hire him in .0012 seconds flat. I’m completely intrigued. Soooo, what do you guys think? Is it a bunch of nonsense or are you a believer? I’m nosy, or as my friend Mir puts it, I’m ‘nosy for intell’. So do share. 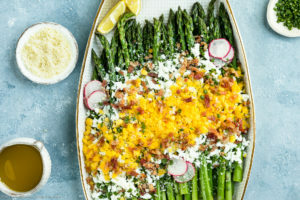 Anyways, none of all that medium stuff really has anything to do with today’s post, other than the fact that Tyler obviously already knows everything I am about to say about this salad. 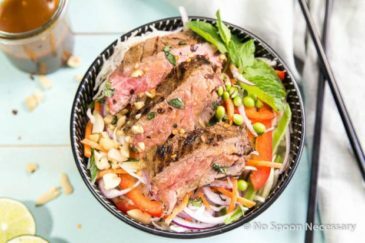 AKA a summer salad thinly sliced in ribbon-y slaw form with Thai flavors and oodles of mango and piles of cashews. 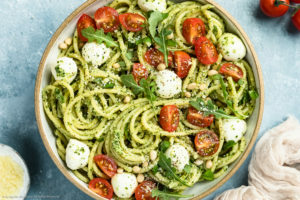 A salad SO scrumptious you absolutely MUST get your summer grubbing little hands on it…preferably before fall arrives, steals all the fabulous produce from the market and makes this salad null and void. 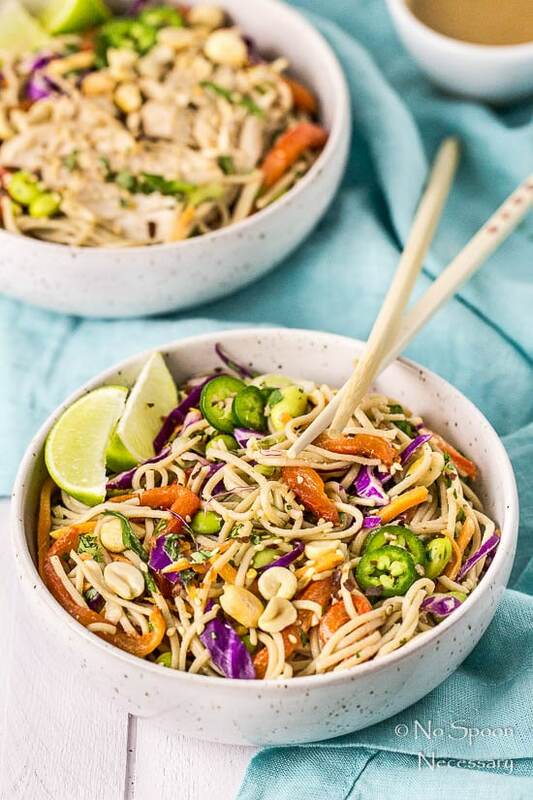 A mix of fresh, savory, crisp and cool shredded cabbage and veggies piled high, generously topped with tropical, sweet mangoes and salty, crunchy cashews and garnished with fresh cooling mint. 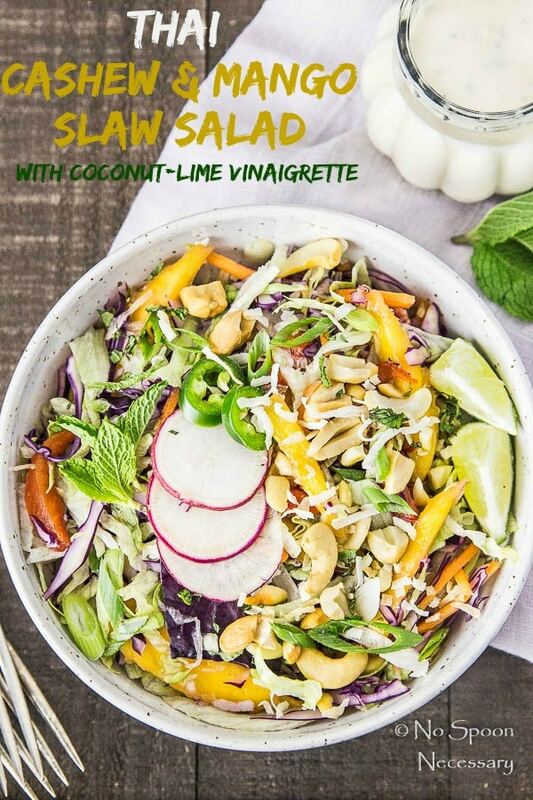 To finish it off – a sweet, slightly spicy, tangy, impossibly creamy and smooth coconut-lime vinaigrette. SWOOOOOON. 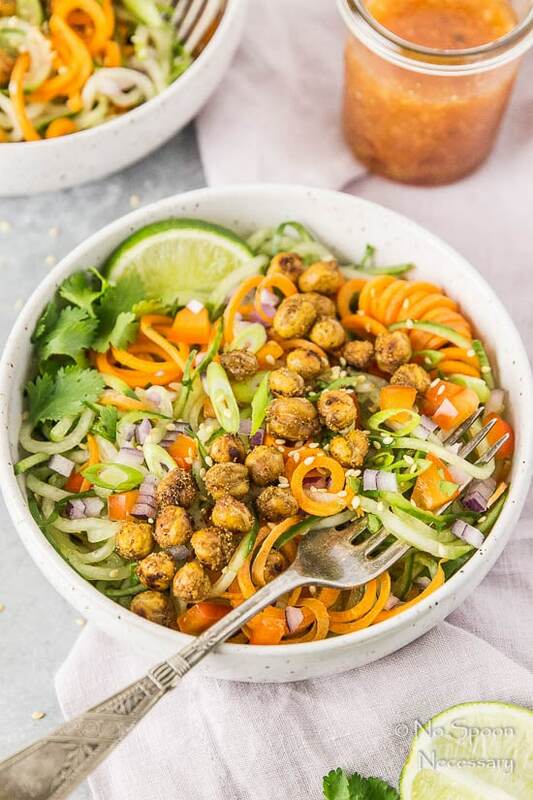  This is THE SALAD of summer, you guys. 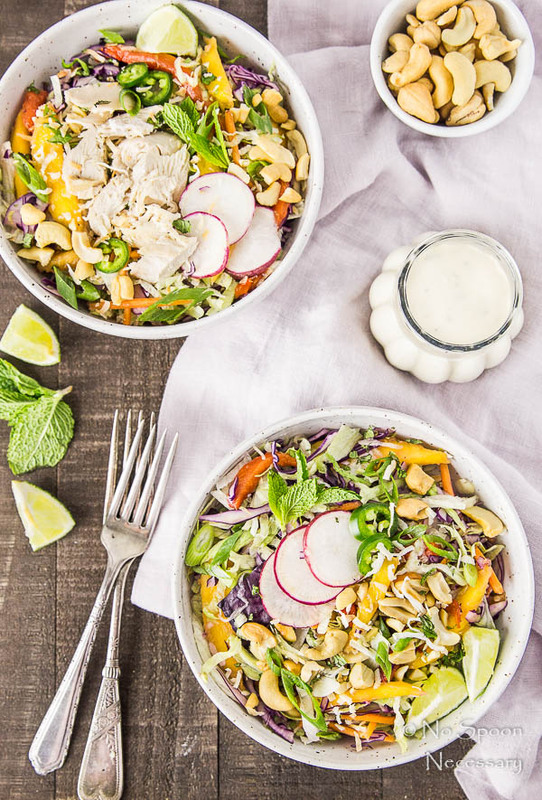 Oh, and if you want to make this salad a heartier meal you can absolutely throw on some chopped or shredded chicken. 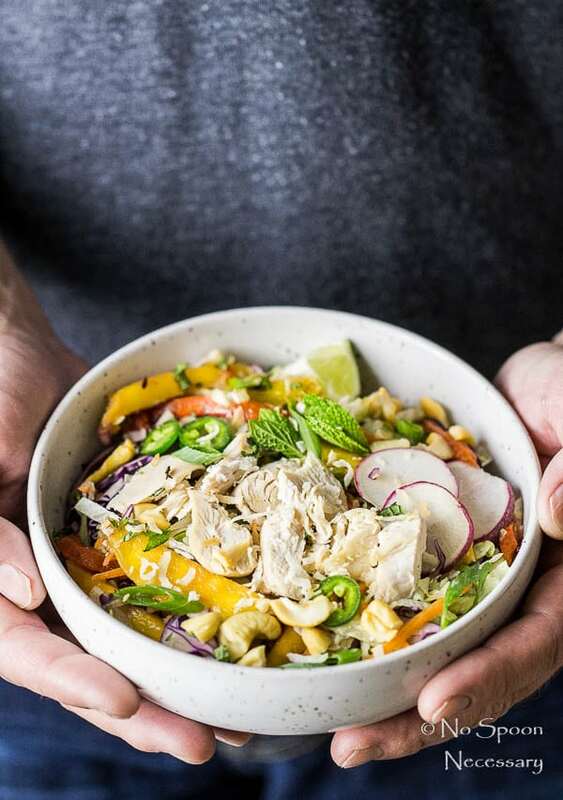 This is where rotisserie chicken saves your substantial salad loving soul. And makes summer meals stupid easy. 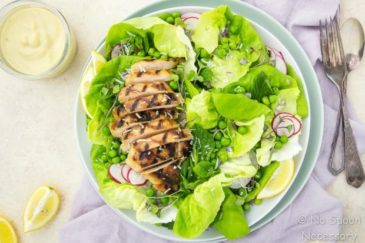 The first time I made this salad I used iceberg instead of the green cabbage. The green cabbage, hands down, tastes the best. However you can substitute iceberg. 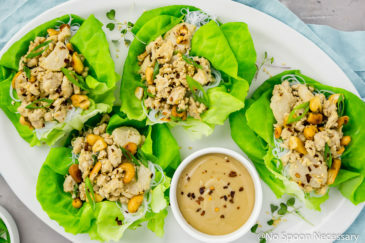 You will need to use a salad spinner and make sure you really get the iceberg lettuce completely dry, or the salad will come out watery and sad. If you want to use a roasted red bell pepper instead of a raw one in the salad, go for it. I did! You can use the jarred variety or roast your own. To do so, preheat oven to high broil. 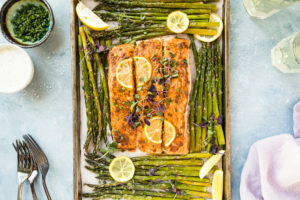 Place the pepper on a sheet pan on the top rack in the oven. Broil, turning every 2-3 minutes until charred on all sides, about 8-10 minutes total. Remove the bell pepper to a bowl and cover with plastic wrap. 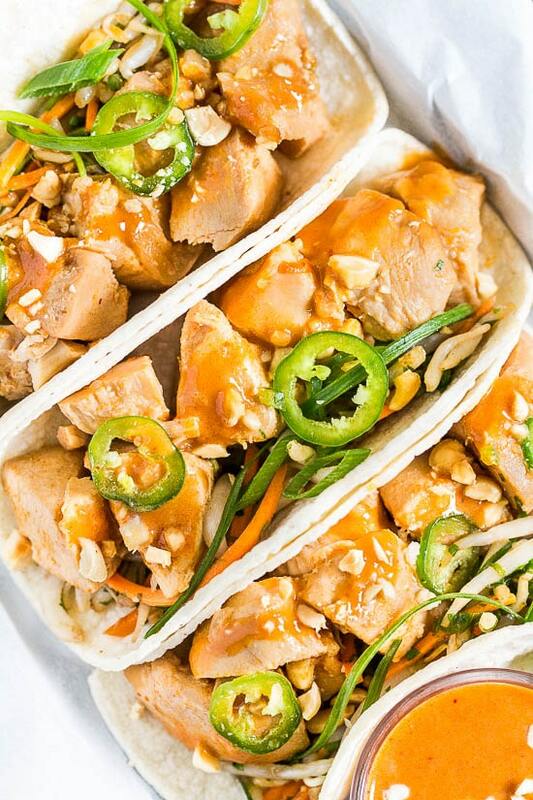 Set aside for 15-20 minutes, then remove plastic wrap and peel the charred skin off of the pepper. The vinaigrette will keep, covered in the refrigerator for up to three days. 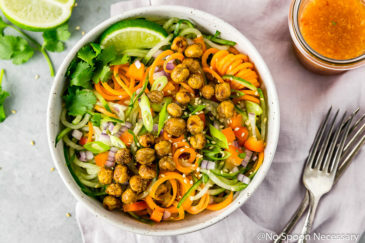 The salad can be made a day in advance, but do not add the mango, cashews, dressing or bell pepper if you roasted it until ready to serve. 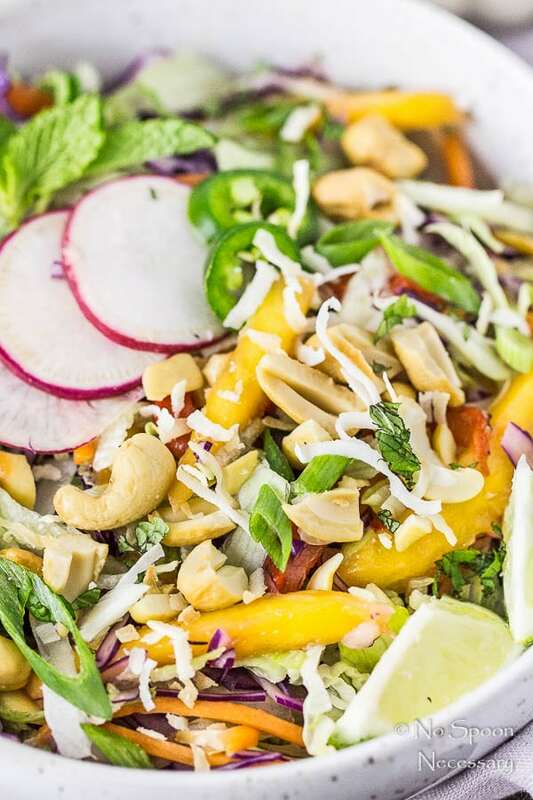 Make this Thai Cashew & Mango Summer Slaw Salad before apples and pumpkins take over the world. You can thank me later, for now just DO THIS. Until Thursday friends, cheers – to salads, slaws and SUMMER. <– All 24 official remaining days of it. 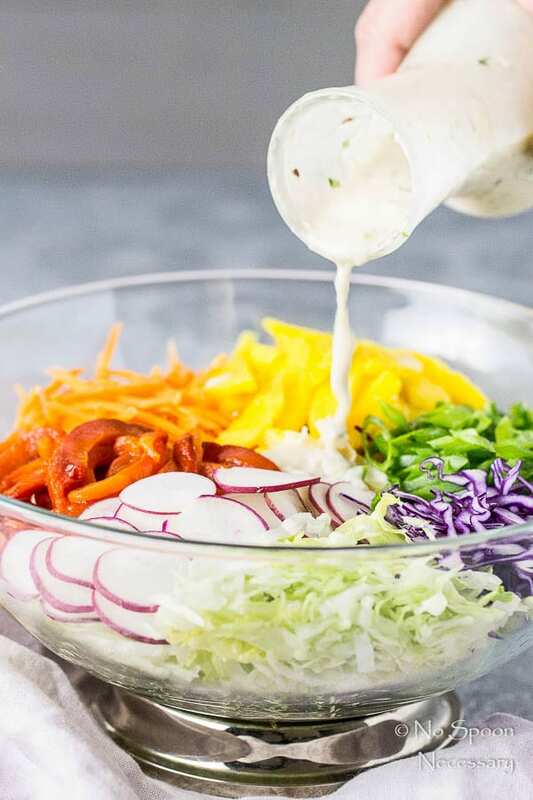 Make the Vinaigrette: In a small bowl whisk together all ingredients. 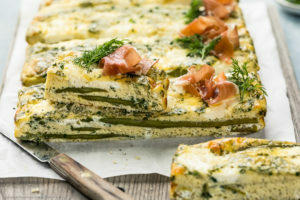 Set aside in refrigerator until ready to use. 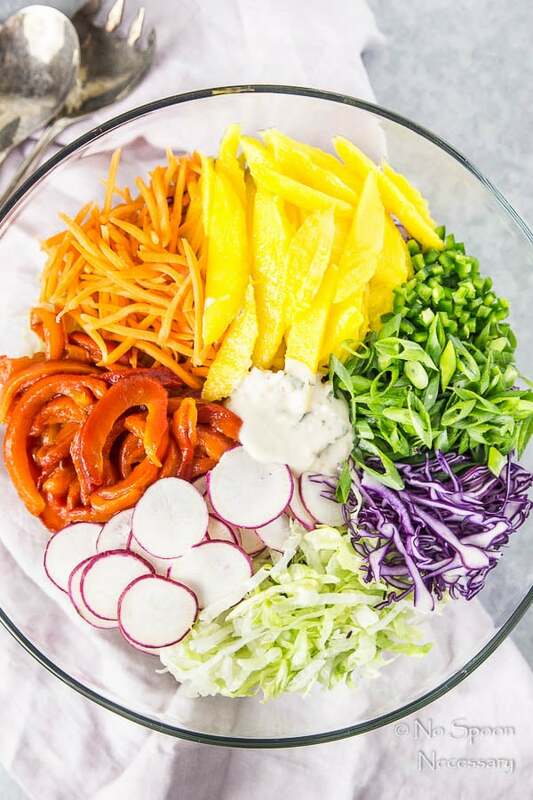 Make the Slaw: In a large bowl add cabbage, jalapeno, bell pepper, green onions, mango and carrots. Toss well to combine. Pour half of vinaigrette over slaw and gently toss to combine. 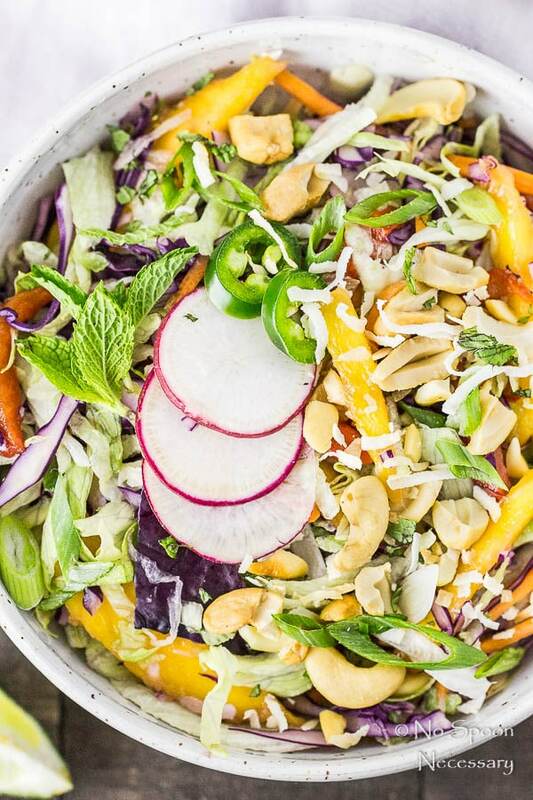 Serve: Divide slaw among serving bowls and top with radishes, mint, cashews and chicken (if using). 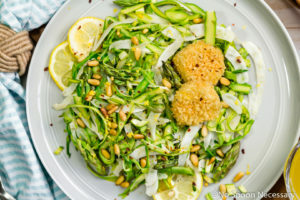 Serve with remaining vinaigrette on side. **Nutritional Information does not include (optional) chicken. You know that I'm loving this salad, Cheyanne. You do salads like a boss, let's just say that. You know I loved that incredible stone fruit panzanella you posted a while ago, so I'm all over this. I love that you are still hanging on to every last second of summer. 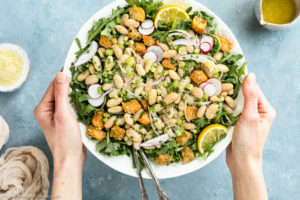 Whilst I am totally ready for the seasons to change and I am already planning my autumn recipes, I can hold back for a while if it means still enjoying epic salads like this. Pass me a bowl please! haha, I was just looking this up! yeah, more than 3 weeks left! bring on the salad!!!! 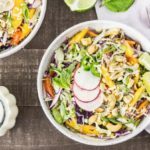 love this thai-cashew-mango-slaw-salad!!! !